Spending hours trying to guess why your baby is distraught is a useless way to lose a night of sleep. Baby Sign Language helps both you and your baby address the root cause of tantrums and allows both of you to spend more time enjoying each other’s company. I am 7 weeks and 3 days pregnant but I have always said that once I have a baby I would teach either girl or boy baby sign language. It has so many benefits and my main interest is for a smoother communication channel, as to being aware of the baby needs and desires and avoid tantrums as much as possible. I am Puertorrican and my husband Egyptian. 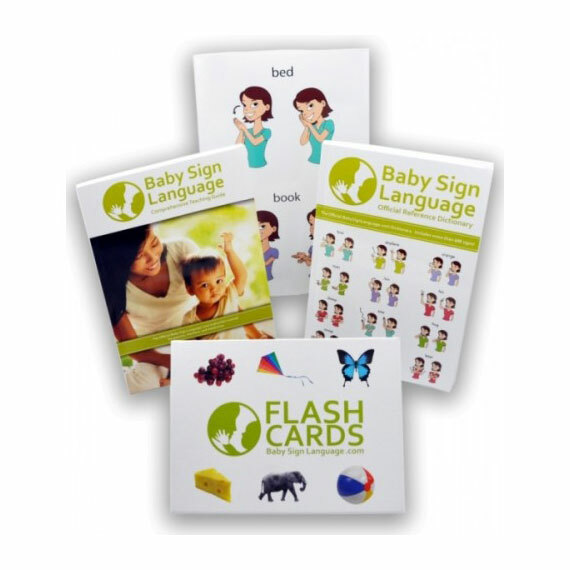 At first I was a little worried about the three language factor and adjusting to the cards but as I read the comments I saw replies from the website saying to place the word in the other languages with tape to tell the baby and not have a problem with limiting the language. We plan to teach the baby Arabic, Spanish and English. Honestly, I find that mothers and fathers that take the interest, effort and time to teach their kids this method end up having a reward, either in parenthood and child’s education. Anyways, I hope to be purchasing a kit soon, mean while the dictionary is very useful. I encourage you to read our quick starter guide. If you are deeply curious and you want to use advanced methods our teaching guide available though our shop will show you the best ways to teach your child how to sign. I loved this article and the part about how it makes children smarter is definitely true. I learned sign language in elementary school as I had 2 friends who were deaf and I picked it up quickly and used it years later. I have a daughter who is now 4 1/2 and is very bright and I attribute signing to her as a baby as well as speaking an additional language to her for that. She not only is able to read, do simple math, and knows her whole alphabet and numbers 1-20 in ASL as well as 15 other signs. So yes sign to your babies and you’ll see the results a few years down the line. My son is almost 16 months old. Is it to late to start teaching him BSL? It is never too late, the advantage of starting later is that they tend to catch on much quicker. If it something you would both enjoy doing, I would go for it. We aren’t in any retail stores in Australia. But, we do ship to Australia. I am from Australia and we have AUSLAN but the resources available here are very expensive. i love this web site, and was amazed at the amount of information on the site. i have two children, my daughter is 2 and half, and son 10 months. when my daughter was about 6 months i had heard about baby sign and the benefits. I wanted to learn it with her but i didn’t know what resources were available, and i didn’t want to spend a lot of money i didn’t have. But i have started teaching both my children from your site and my daughter loves it. Thankyou so much for putting up the site and i can’t wait till your BSL kit is available, and i would like to know if it would be possible order it from Australia. thanks again. Thanks for the kind words. We do plan to offer the kit internationally. 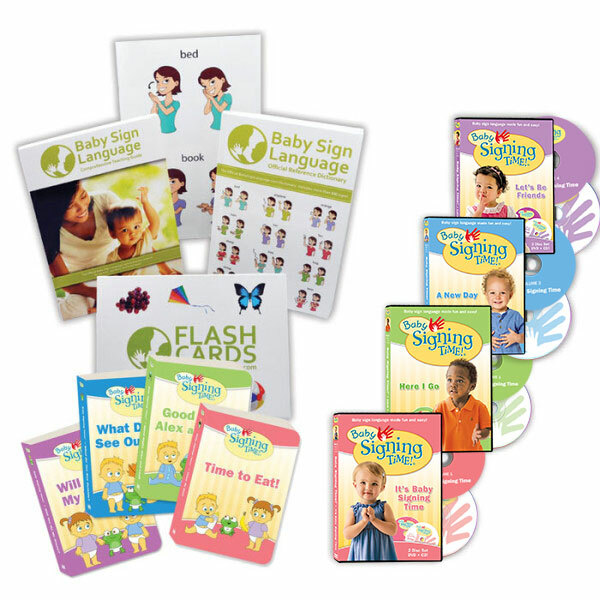 If I teach my baby sign language, I am scared that it will take them a longer time to talk and instead of speaking they will revert to only using sign language. That is a common concern, that learning BSL will lead to delayed verbalization since the baby can get by with signing and does not want to put the effort into signing. The research that has been done all seems to suggest the opposite. Babies that learn to sign speak earlier and develop bigger vocabularies faster. In fact, BSL is now commonly used by speech pathologists with children having difficult speaking to help them progress to speech. When a baby signs it is a bridge to full speaking that helps them develop some of the mental processes that will be used when they speak. In much the same way that crawling helps a baby to walk, baby signs helps a baby understand the basics of communication. When they start speaking they will sign simultaneously, which lets you figure out what they are saying and avoids frustration. When their word pronunciation is good, they naturally drop signing and just use speech because it is quicker and faster (in the same way that a toddler that can walk with stop crawling). Love your site! I’m a librarian and will be sharing this site with the moms of my babies and toddlers during our weekly programs. I signed with my son and it was a fantastic experience. He was able to tell us with signs what he needed before he could say the words, which cut down on his frustration level AND ours. Most of his first words were of those things he learned to sign (milk, eat, more). People marvel at his communication skills at 2 years old and I attribute much of that to his early language experience with signing. We’ve just started introducing signs with our 6-month-old daughter and I’m optimistic the experience will be just as successful! What a great resource! Thank you so much for putting together such a wonderful website on baby sign language. My daughter is 4 months old and we can’t wait to get started. The videos are excellent learning tools for parents/family members. 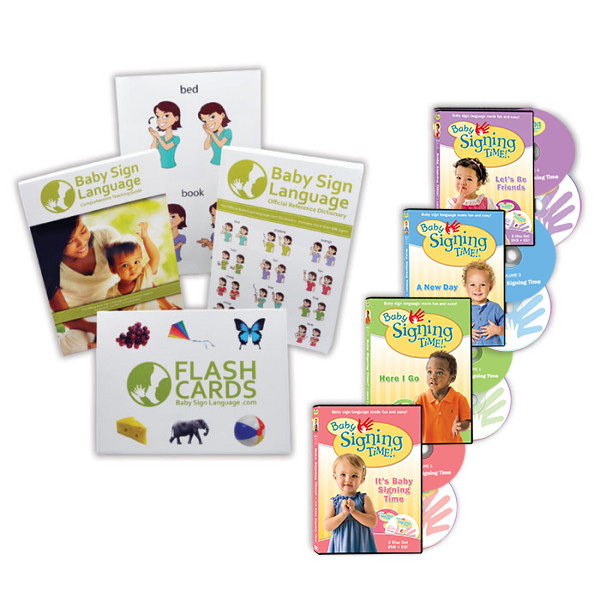 Hi, how early can you start teaching a baby sign language? You can start as early as you want, but you have to be more patient for results. Between 6-9 months is a good time to start, because you typically wait less than two months to see results. If you start earlier (e.g. at birth), you will see typically results a little earlier. This has been a very useful tool in helping the communication between us (Mom and Dad) and our beautiful little boy. We learned about this through a program offered in our area that helps new families get started and have been using it since our little man was about 9 months old, I was skeptical at first but as I started seeing the results I was completly hooked. Thank you for provideing this education for families. We need to find a way to get the word out more so that other people can use this tool. This is a WONDERFUL site! My daughter is 22 months and I started signing with her at 4 months. I took an introductory class from a lady in our community and I started signing to my daughter that day and haven’t stopped. She did her first sign (water) at 9 months, but she was understanding at 6 months. It has been the best thing EVER! We both enjoy it and people are amazed. I know for a fact that it helps her feel more in control and more a part of everything that’s going on, plus it gives her great pride to see us get excited every time she learns a new sign or practices an old one. I only wish I had known about this when my son was little! Thank you for being a great resource for vocabulary and a place where I can send people who have questions or are a bit skeptical. Hi…just want to thank you for the awesome information on your site. Also want to say that though I don’t know her (your?) name….the woman who is in the video clips is such a pure joy to learn from….so natural and enthusiastic that one can’t help but get excited about signing. I am so eager to start with my grandbabies- and hope to involve, inspire and encourage their parents (my own children!) to start signing now!.